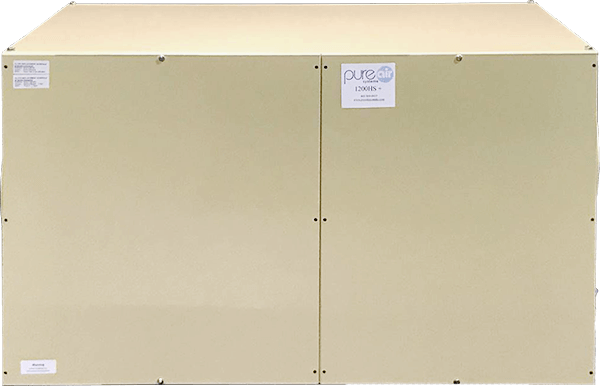 The intent of this section is to describe the unique capabilities of the HEPA and Carbon based air filtration systems available from Pure Air Systems, Inc. The addition of the new GE ECM variable speed motors and the digital controllers add a whole new dimension to the abilities of these systems to be utilized in areas of airborne contamination control. We offer four basic models of our HEPA Shield air filtration systems. The HEPA 600HS and HEPA 600HS PLUS (600 CFM), HEPA 1200HS PLUS (1200 CFM) and HEPA 2000HS PLUS (2000 CFM) and HPS Portable Units . The 600 HEPA Shield unit is available in both the standard, single speed, 1/3 HP AC induction motor design and the new HEPA PLUS design using the 1/3 HP GE ECM variable speed motor with either an HVAC or DCU controller. Like all of our air filtration systems, this unit has three air filters. A polyester dual layer ring-panel prefilter, a 5 lb carbon air filter and a True IES Specified, Hot DOP tested 99.97% at .3 micron metal-framed HEPA air filter. Typically, the standard HEPA 600HS unit is used in a partial-bypass configuration and is normally attached to heating / cooling systems in the 2 to 4 ton range (800 CFM to 1400 CFM). It can be used with 5 ton systems; however, we often recommend using the 1200HS series for systems 4 ton or larger. 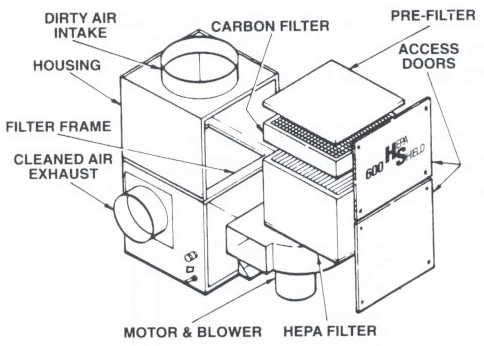 The HEPA 600HS unit can also be used in a stand-alone configuration where a single speed, single volume HEPA air filtration system is required. The 600HS unit comes in two sections, top and bottom. They are symmetrical so you can rotate the two sections in four different directions for best inlet / discharge orientation. The HEPA 600HS PLUS HVAC version is identical in size and configuration to the standard HEPA 600HS unit except it utilizes the new GE ECM variable speed 1/3 HP motor. The controller on this unit is designed to work off the signals produced by the thermostat. It will run at the designed high speed during the heating or cooling cycles, then ramp down to one of four off-demand speeds after the heating or cooling demand has been achieved. The motors are much more efficient than the standard AC induction motors. They will use 20% less electricity at full speed operation compared to the standard motor and they will use up to 50% less electricity when running at the low speed (off-demand mode). They are quieter and torque sensitive, meaning they will maintain the same speed even as the pressure drop increases across the filters. The HEPA PLUS HVAC unit can be used with either a variable speed heating / cooling system or any standard heating / cooling system. The HEPA 600HS PLUS DCU unit is identical to the HEPA 600HS except it uses the new GE ECM variable speed 1/3 HP motor. The controller for this unit is a digital speed controller that allows you to control the speed from 1% to 100% of volume in 1% increments. We also offer a dial controller. Both the two-set dial digital controller and the dial controller can be mounted either on the unit directly or in control box for remote operation. In addition, we can supply an infrared remote controller when required. The 600HS PLUS VCU unit is used in areas where you need to control the speed of the fan to maintain certain airflows. 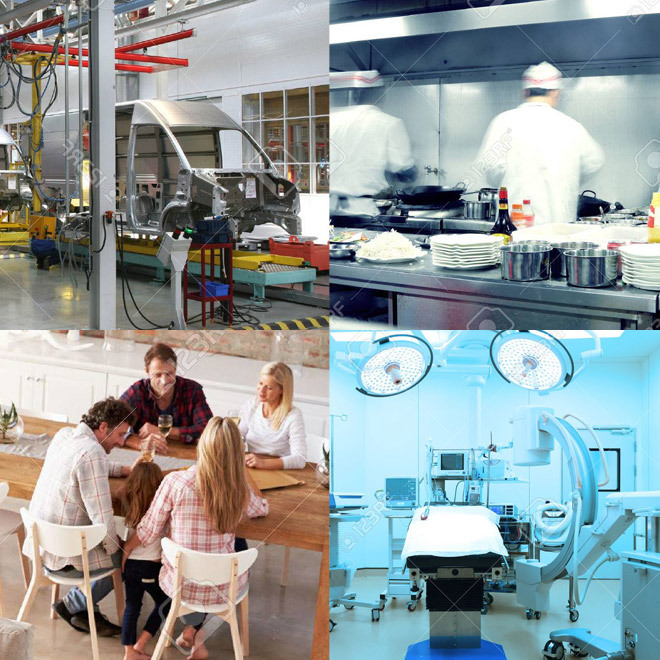 This can be a residential application, commercial, laboratory, school, hospital, etc. Again, the ECM motors are extremely quiet and perfect for those areas where noise control as well as HEPA air filtration is necessary. Like the HEPA 600HS unit, the HEPA 1200HS unit comes in both a standard single speed motor (3/4 HP) as well as the GE ECM 3/4 HP motor in the PLUS version. Unlike the HEPA 600HS unit, the HEPA 1200HS and HEPA 1200HS PLUS units come in two different design configurations. First, the “L” version. The “L” version is a two-piece unit that is just like the HEPA 600HS system. It has an inlet on the top of the unit (14″) and a discharge on the side of the bottom section ( 14″). Like the HEPA 600HS unit, the top and bottom sections are symmetrical so you can rotate the top and bottom in four different directions for best inlet and discharge to connect the unit to the heating / cooling return air duct. The second version is the “S” configuration. This is a single piece, straight-through design with the inlet on one end and the discharge on the other end (14″ ). The straight-through version was designed for applications where the system needed to be used in conjunction with a horizontal heating / cooling system or for stand-alone applications. 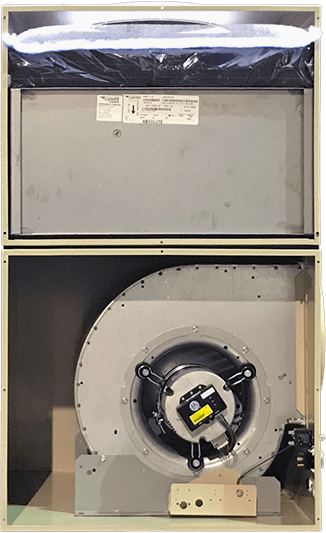 The HEPA 1200HS “S” has four 3/8″ weld nuts located on the top four corners of the unit so the system can be supported using threaded rod from a ceiling area if necessary. The HEPA 1200HS PLUS unit can be used as a stand-alone system and have its own return and supply ductwork. It can even be used as an air conditioner simply by adding a 2 to 3 ton cooling coil on the discharge side of the unit. The new version of the HEPA 2000HS unit comes only in the PLUS design using a 1 Hp GE ECM motor. The 1200HS and the 2000HS HEPA air filtration systems / units are identical in size and filter type. The only difference is we use a 1HP motor in the HEPA 2000HS and a 3/4 HP motor in the HEPA 1200HS. The 2000HS PLUS comes in both the “L” configuration and the “S” configuration. Currently the HEPA 2000HS PLUS comes either with an HVAC controller for attaching the system to an HVAC unit in a partial by-pass mode, or a VCU variable speed controller for use when using the HEPA 2000HS PLUS in a stand-alone configuration or when you want to put all of the air through the HEPA 2000HS PLUS in conjunction with an HVAC system. 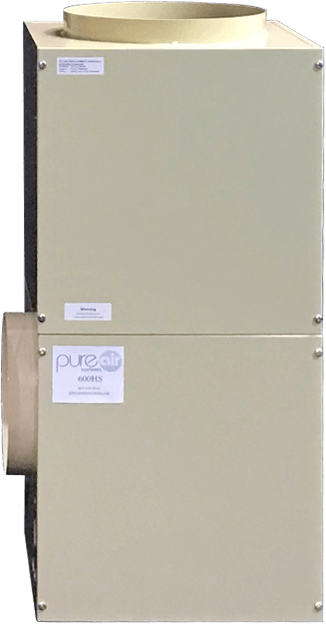 As with all of the Pure Air Systems units, the HEPA 2000HS PLUS can be used to introduce outside filtered, fresh air. 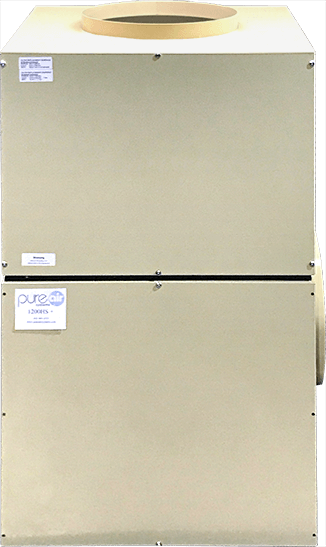 In addition, you can use the 2000HS PLUS as a combination air filtration/air conditioner just by putting a 2 to 3 ton a coil on the discharge side of the system. The HEPA 2000HS PLUS is one of the most powerful and versatile HEPA air filtration systems on the market today. Any of the HEPA Shield PLUS units can be controlled by a variety of digital control units. The HVAC controller operates off a standard thermostat. The VCU digital control unit has single dial controller for finite speed control from 1% to 100%. This controller can be mounted on the unit or in a remote box. The HEPA Shield systems can be used for numerous applications in the residential, commercial and institutional markets. They can be installed in conjunction with any type of forced air ducted heating / cooling system, or used in a stand-alone application. The HEPA Shield systems can use other types of media air filters for applications that don’t require a filter as efficient as a HEPA. For example, in the 1200HS and 2000HS units we can put any ASHRAE box style air filter from 45% to 95% in place of the HEPA air filter. This would be for applications where dust loading is high and the particles are larger. Another option is to use carbon or other adsorptive medias in-lieu of the HEPA air filter. These Odor Adsorptive systems are described in more detail in the following pages. Since the introduction of the HEPA 600HS unit in 1985, the HEPA Shield systems have been used in a wide range of applications. Listed below are just some of those applications. 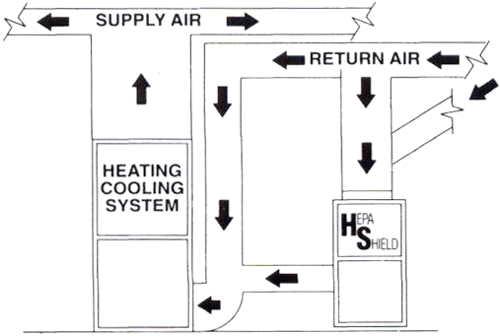 Any of the HEPA Shield models can be attached in the partial by-pass configuration as shown below. Depending upon the size of the heating / cooling system and which HEPA Shield unit you select, you will be able to filter ALL the air from 24 to 48 times per 24 hours. In addition, you will NOT add any static load to the heating/cooling fan system. The new “PLUS” series using the GE ECM motors and the HVAC controller allow for continuous operation in “on demand” and “off demand” modes of operation. These units are perfectly suited for use with the new variable speed heating/cooling systems. In many cases the HEPA 1200HS and HEPA 2000HS PLUS VCU versions can be utilized to filter all the air through the heating / cooling system. This can be done for systems up to five tons. For larger systems multiples of the HEPA Shield units can be used. An emergency by-pass damper or controller is required. The diagram below shows a typical installation. 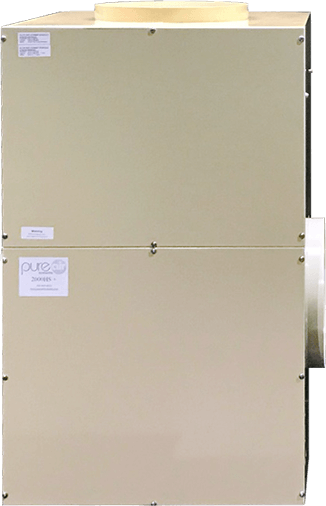 With the addition of the new GE ECM Variable Speed motors, and a complete compliment of housing configurations for our HEPA 1200HS and HEPA 2000HS units, Pure Air Systems, Inc. offers one of the most complete lines of HEPA based and Carbon based air filtration systems on the market today. Every model has the ability to be used either attached to an HVAC system or in a stand-alone configuration. In addition, all three air filtration models can be made only with carbon or other adsorptive medias to offer VOC and odor control systems for numerous applications. MODEL HEPA 600HS/600HS PLUS: 600 cfm, 16-3/4″ x 16-1/4″ x 34″, 97 lbs. (two sections), 120 volt, 15 amp circuit, 1/3HP (4.9 amp) motor, 3 Filters: prefilter, 5 lb carbon, 99.97% HEPA. MODEL HEPA 1200HS/2000HS & PLUS: “S” Version: 1200 to 2000 cfm 24″ Deep x 25″ High x 48″ Long, 145 lbs (one piece unit) 120 volt, 15 amp circuit, 3/4HP (9.6 amp) motor , or 1HP (12.8 amp) for 2000HS. 3 Filters: prefilter, 15lb carbon (optional 2nd carbon) 99.97% HEPA. MODEL HEPA 1200HS/2000HS & PLUS: “L” Version: 1200 to 2000 cfm 25″ x 25″ x 42″, 165 lbs, (two piece unit) 120 volt, 20 amp circuit (for 2000), 3/4HP (9.6 amp) motor – 1200HS, 1HP (12.8 amp) motor for 2000HS. 3 Filters: prefilter, 15 carbon, 99.97% HEPA. *Models HEPA 1200HS & HEPA 2000HS can also be used with 65% & 95% ASHRAE air filters as well as 95% DOP air filters for applications where HEPA is not required. All units are designed to introduce outside filtered, fresh air. For more information contact Pure Air Systems, Inc. or your local dealer.